It is no secret that sleep is important and essential to our health, how we function, our frame of mind, and so much more. Sleep plays a huge role in our physical and emotional health as adults and it is just as important for our babies. We all know how we feel when we haven’t gotten a good night’s sleep, stayed up too late, or tossed and turned but have you thought about how your baby feels when they are not sleeping well. Babies rely on their caregivers to insure they are getting enough sleep and finding a routine that affords them a regular sleep schedule. Now, I’m not at all suggesting a rigid sleep schedule is the right or only way to help your baby sleep. Sometimes being too rigid can cause a completely different problem with getting your baby to sleep. A routine and schedule is however important. Babies need sleep for both physical and emotional growth and development. While babies are asleep, their body’s work to support healthy brain function as well as to promote physical health. Sleep improves learning abilities, problem solving skills, coordination, the ability to control emotions & behavior, and the ability to cope with surroundings. Every one of these things is essential to a baby’s development. In babies and children, sleep is important for physical growth as well. The growth hormone is released more intensely in babies and children just after they have reached a state of deep sleep. Lack of this hormone can cause inadequate growth, lung and heart function, and weakened immune system. Getting to know your baby is the first step in establishing healthy sleep habits. Not all babies are created alike when it comes to when and how much they sleep. Some babies may sleep all night for 12 hours and take very few naps or only short naps during the day. Other babies may sleep for 2-3 hours to a time throughout the entire day. 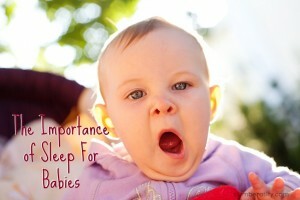 What is important is to make sure that your baby is offered a routine that encourages and is conducive to sleep. Provide your baby with a quiet, dark place to sleep regardless of whether it is bed time or nap time. Set up a routine that is calm and less stimulating as you near a nap time or bed time. Avoid excitement or commotion when you are preparing to put baby down to rest. Try to offer this same routine whenever it is time for baby to go to sleep. As baby grows and becomes a toddler, maintain a similar routine and continue to encourage good sleep habits.